Assuming a patient is already taking allergy medications and even undergoing allergy shots, the other component for good allergy symptom control is avoidance. You can certainly add good filters to a home's HVAC system, but what about outside??? What if avoidance is impossible? For example, if you need to cut the grass on your lawn and you have severe grass allergies or if you need to clean out a moldy basement and you have bad mold allergies? That's when wearing a face mask or respirator may be beneficial to prevent inhaling large quantities of allergy inducing particulates. 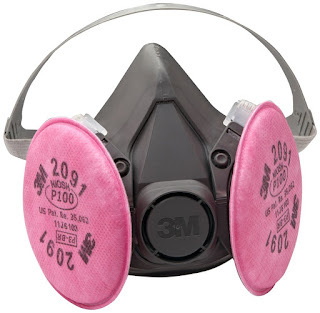 Such "personal respirators" are classified according to criteria set by the National Institute for Occupational Safety and Health (NIOSH) and are classified into 3 distinct groups: N-Series, R-Series and P-Series. The N-series protect against solid and liquid aerosol particulates that do NOT contain oil. The R-series and P-Series protect against both solid and liquid aerosol particulates that MAY contain oil. The R-series are typically certified for only 8 hours of use after which it should be thrown out whereas the P-series are typically certified for 40 hours or 30 days of use, whichever comes first. Due to the limited effective duration of the R-series, most individuals will use P-series. Within each of these groups, there are three different efficiency possibilities: 95, 99 and 100. These numbers represent the filter efficiency. As such, N95 represents a mask that will filter out particulates (0.3 microns or greater) with 95% efficiency. Obviously, the higher this number, the better the filter. A N100 or P100 mask is essentially equivalent to a HEPA filter. For allergy purposes, the N-series work just fine with the N95 being adequate for most allergic individuals. Of course, one can always go with a higher rated mask such as N99 and N100 which work even better, but can cause an increased sense of air resistance when breathing causing some individuals to feel suffocated. If individuals are ALSO sensitive to chemical fumes, the P-series respirators should be used instead. For individuals who are sensitive to plastics and/or polyesters that standard masks are made of, Vogmask does make N99 respirators made from organic cotton. However, they are quite a bit more expensive. All these masks are available for purchase on Amazon. For more info on filters for a home's HVAC system, click here.